﻿ Africa’s Regional Powers Are Key to Climate Negotiations – But Will They Cooperate? 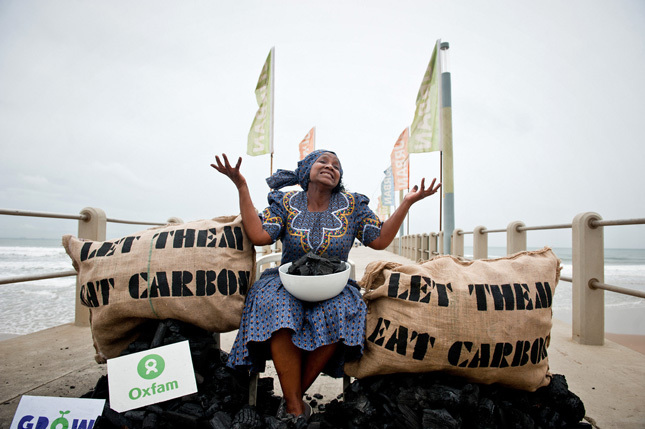 Africa’s Regional Powers Are Key to Climate Negotiations – But Will They Cooperate? Most African states are more vulnerable and less prepared to address climate change challenges than the rest of the world. This observation is supported by a wide variety of sources, including the Climate Vulnerability Index and the Notre Dame Global Adaptation Index. And in fact Africans and their political leaders frequently observe that this crisis, manufactured in the developed world, disproportionately affects their continent. During a meeting of the African Union in 2007, Ugandan President Yoweri Museveni called climate change “an act of aggression” by the rich against the poor. In response to these concerns, African states have worked collectively to influence global climate change negotiations. Two pillars underpin their approach: one is the development of an “African Common Position,” the other is the formation of a negotiating coalition for presenting that position. In some respects, these efforts have been met with success. Most African states were present to sign the Paris Agreement in New York this past April. That agreement promises to deliver on one of the continent’s key demands in negotiations: funding to adapt to climate change effects that are already present and will arise in the future. However, African attempts to act collectively on climate change face important challenges. One key factor is the behavior of its major regional powers: Egypt, Ethiopia, Nigeria, and South Africa. All, with the notable exception of Nigeria, have attempted to play leadership roles in negotiating on behalf of the continent with varying degrees of success and priorities. In a new paper in Global Environmental Politics, I argue that the interests of these four powers often differ from those of the rest of the continent. Additionally, even where they share interests, they often view the negotiation process as serving goals other than solving the problems of climate change. Given that the Paris Agreement represents only the first step in a new approach to addressing global climate change, understanding these dynamics is important for the future of the continent. The challenges of unifying the interests of more than 50 African countries, populated by over a billion people, on the second largest continent are daunting. It is unsurprising interests and priorities vary across the continent; however, the divergent interests of the regional powers are especially important. South Africa’s energy consumption and carbon emissions, especially due to coal, immediately set it apart from the rest of the continent. Economically, it is in a far better position to cope with climate change than most countries on the continent. Egypt similarly benefits from a higher level of development, which tends to correlate with higher carbon emissions. However, it is clear that the potential for rising sea levels and changes to the Nile River have made climate change a more central issue. Nigeria is also highly vulnerable to the impacts of climate change, especially on agriculture, coastal flooding, and desertification. However, its economy is sensitive to policies that would reduce oil demand. This might go far to helping us understand how a country which actively strives to lead West Africa and the rest of the continent in so many other areas, including trade and security, has been mostly quiet on climate change. Finally, Ethiopia – the weakest of the four regional powers considered here – is closest to continental averages in terms of vulnerability and readiness. Its leadership on climate change, particularly through former Prime Minister Meles Zenawi, has been mostly tied to its own national interests. Regional powers often view climate change negotiations as part of a larger strategic situation. The choice to work with African partners can have less to do with climate change than with other policy goals, such as maintaining influence with global partners or increasing their status with domestic audiences. Egypt, for instance, must contend with its dual membership in both the Arab Group (known to make statements about the scientific uncertainties of climate change) and the African Group (often called “progressive”). Similarly, Nigeria’s membership in OPEC sets it apart. For Ethiopia, the domestic audience may be most important. Addis Ababa benefits from the external legitimacy granted when others recognize it as a regional leader on such a major issue, bolstering its domestic position. South Africa represents perhaps the most interesting case. South Africa’s leaders have been attempting to strengthen their regional and global roles for some time, even apart from climate negotiations. Former President Mbeki’s plans for an African Renaissance stated that “it is necessary that, acting together, we ensure that Africa…occupies her due place within the councils of the world.” President Zuma’s global ambitions contributed to South Africa’s membership in the BRICS alliance (Brazil, Russia, India, China, and South Africa) and that membership in turn seems to rely at least partially on South Africa’s ability to represent the continent (a source of contention for many). All of this has the potential to undermine a unified African position in climate change negotiations. South Africa’s external alliances, for instance, have pushed it to take positions other African partners oppose. Those differences were perhaps most on display in the brokering of the Copenhagen Accord in 2009. At the same conference, Ethiopia’s Prime Minister, acting as head of the Committee of African Heads of State and Government on Climate Change, also departed from the African script, endorsing French and American positions instead. Africa still needs its regional powers. African attempts to forge a common position and approach to climate change only became significant following Kenya’s hosting of the 2006 UN Framework Convention on Climate Change Conference of Parties. In the decade since, the “two pillars” has emerged, reflecting a growing tendency for African states to use coalitions to influence global affairs. The support of the regional powers can add important political weight to these coalitions. The good news for most African states is that on some issues, such as the transfer of technical knowledge from developed countries and funds for adaptation, there should be general support from these regional powers. The bad news is that it might be harder to gain unified support on issues where interests are more likely to vary, such as requirements for reducing carbon emissions. Additionally, it may be necessary to monitor the behavior of the regional powers to ensure their final goals in negotiations are focused on the continent’s collective interests and not on other regional and global strategic positioning. Michael Byron Nelson is the chair of African Studies and an assistant professor of government at Wesleyan University in Middletown, Connecticut. Sources: American University of Beirut, Center for Global Development, Economist, Egypt Independent, Energy Policy, Global Environmental Politics, The Guardian, Issam Fares Institute for Public Policy and International Affairs, Nelson (2016), Notre Dame Global Adaptation Index, Political Research Quarterly, United Nations University. Photo Credit: A protest organized by Oxfam in Durban, South Africa, December 2011, courtesy of Ainhoa Goma/Oxfam.